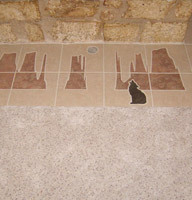 Unique Waterjet Cutting Application: Mosaic Tiles - Blog | Red River Precision Mfg., Inc.Blog | Red River Precision Mfg., Inc. This entry was posted in Water jet cutting and tagged Applications of Waterjet Cutting in Architecture, How to Cut Mosaic Tiles, Waterject Cutting Applications, Waterjet Cutting Ceramic Tile, Waterjet Cutting for Design, Waterjet Cutting Mosaic Tiles, What is Waterjet Cutting, Why Choose Waterjet Cutting by TWPredriverprecis. Bookmark the permalink.